Before I start rhapsodizing about this roasted caprese salad, I should go on record by saying I love the traditional version of caprese salad a ridiculous amount of love. 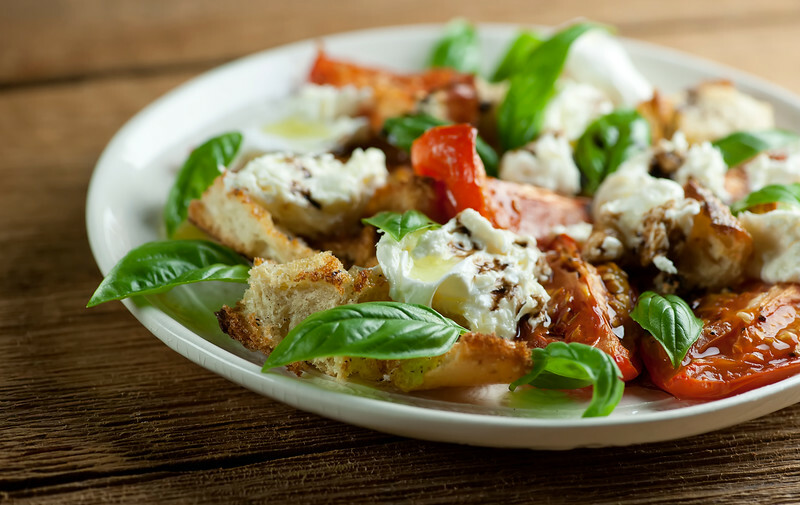 Sliced tomatoes and mozzarella cheese and chopped basil, all drizzled with a little balsamic vinegar and olive oil – I mean, what’s not to love there? And I make it over and over and over when the tomatoes are local and the basil is abundant. But then I got to thinking…what if I shook it up just a teeny bit? What if I kept the tomatoes and the basil, but swapped out the mozzarella for its show-off cousin, burrata cheese? What if I added a little torn and toasted bread to sass things up a bit? What if? I’m guessing you know the answer, since I’m about to say (say it with me now), let’s make it!It starts, as it must, with the very best tomatoes you can find. The better the tomato, the better the caprese. I always look for the heirloom tomatoes. They are not as pretty as their cousins the beefsteak tomatoes, and they are usually a little more expensive, but they are the ultimate in sweet tomato flavor. Once you go heirloom, you don’t go back. And of course, the basil. Side note: To the woodchuck who lives in my back yard who loves the taste of fresh herbs, especially basil: I’ve got your number, mister. After three rounds of planting and chomping, I have moved my basil indoors. You can come look at it through my kitchen door, but that’s as close as you’re gonna get from now on. Ha. Now here is where I went rogue, caprese-salad-wise. First off, I roasted the tomatoes. Roasting tomatoes not only softens them up, but gives a mouthwatering richness to that tomato flavor. Second, that burrata. While you definitely CAN stay with the traditional mozzarella for this salad, burrata takes everything to a new level of decadence. If you’ve never tried burrata before, it’s basically mozzarella that is filled with cream and soft cheese curds. When you tear it apart like I do for this salad, it kind of melts into dollops of creamy, cheesy heaven. I got mine from Maplebrook Farms (yay Vermont!) but it is easily found in specialty cheese sections of supermarkets these days. Last but not least, I added a little more substance to the salad by adding a little bread that I tore into bite-sized chunks, tossed with olive oil and salt and pepper and toasted. 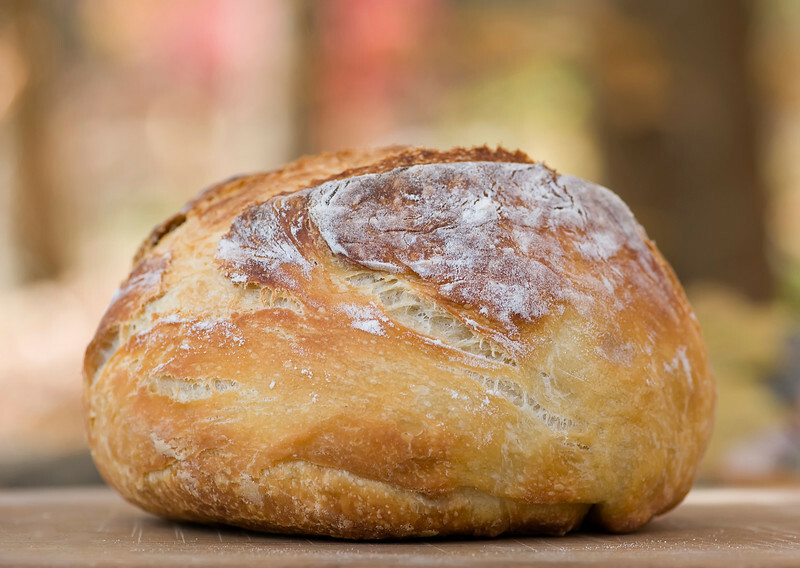 You can use whatever bread catches your fancy – a baguette, Italian bread, some brioche…I like using my beloved almost no knead bread, mainly because I like having any excuse to make it. Once you have all your ingredients assembled, it’s as easy as arranging them on plates, drizzling a little balsamic vinegar and olive oil on top, and giving everything a scatter of sea salt and fresh ground pepper. If that isn’t the heart of summer on a plate, I don’t know what it. Happiness! Preheat oven to 425. Line a rimmed baking sheet with foil. 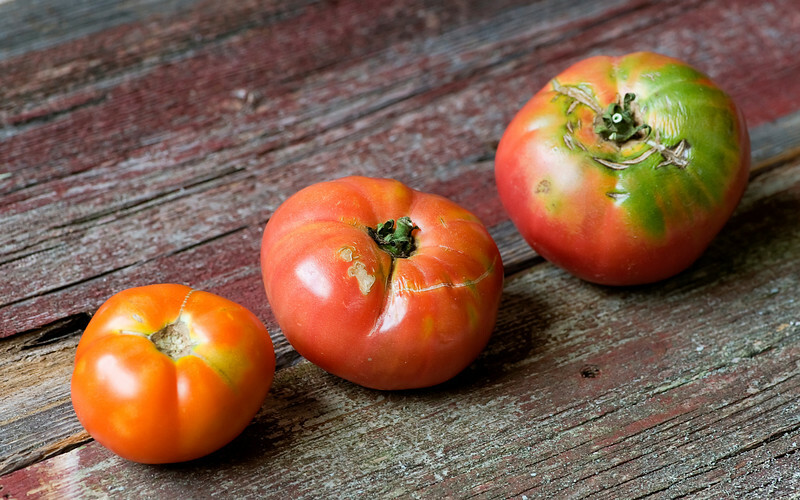 Toss tomatoes with 2 tablespoons olive oil and place in a single layer on baking sheet. Sprinkle with salt and pepper and roast until tender, about 30 minutes. Leave oven on for bread and let tomatoes cool while bread is toasting. Toss bread with olive oil and a pinch each of salt and pepper. Toast in oven until golden. Divide bread, tomatoes, cheese and basil leaves among 4 plates. Drizzle with a little balsamic vinegar and olive oil. Sprinkle with salt and pepper and serve. Caprese ANYTHING is a favorite of mine and I love experimenting with new ways to incorporate the flavors. This roasted salad looks perfect, Kate! Love the addition of bread in here! What a naughty woodchuck! 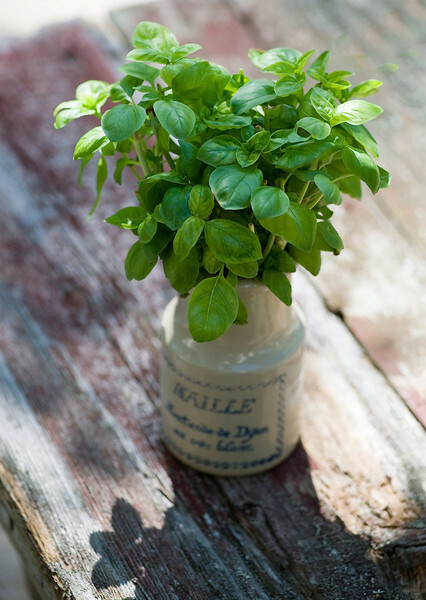 ;) I’m having enough basil problems and I don’t even have an animal involved – just an inexperienced gardener!!! I bet this salad has so much flavor. The basil that has survived my black thumb will soon be used to make this salad – I’m sure of it! Love Caprese salad! I have so much basil this is the perfect way to put it to use! Roasted tomatoes are so juicy and delicious. I love caprese salad too! So much! So it’s great to see a modified version of it! And heirloom tomatoes? Yes please! Roasting the tomatoes is brilliant! Pinned! Have a great week! I’m totally drooling over that plate Kate! Caprese salad is one of my most favorite summer dishes and I love how you’ve changed it up a bit! Can’t wait to try! There’s a local restaurant here that serves burrata cheese and they’re always out of it because everyone LOVES it. So you know I’m in line to try this salad! So many delicious flavors going on here! Just gorgeous! This looks amazing! 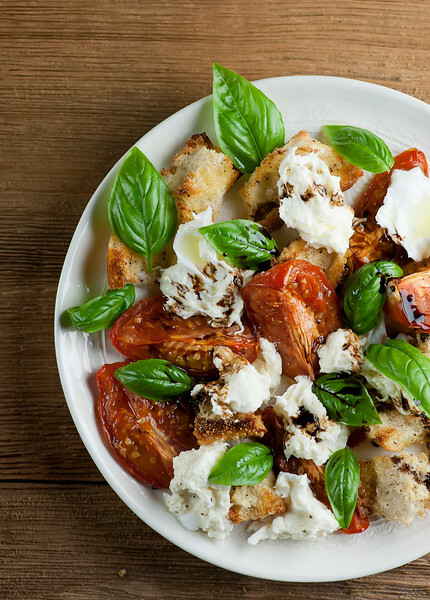 What a great spin on a caprese salad. I’ve never tried burrata before, but I have a sneaking suspicion that once I do I’m never going to want to stop eating it! ???? Good God, that looks delicious. i’m such a fan of the caprese combination! my basil plants are pretty puny this year and i haven’t gotten nearly as much off of them as i’d like. what little i have gotten has been reserved for dishes much like this!